For years Toyota has been able to sell the Taco on the back of its history building simple, indestructible trucks. They still do, owning a huge portion of the midsize truck market with a great product that essentially is sold with no engine. That's going to change, with the 2016 Toyota Tacoma getting the new direct-and-port-injection V6 it needed. The mid-size/compact truck market, once mighty, dwindled over the last decade as both Ford and Dodge mostly abandoned the market and Chevy offered a weak Isuzu copy. Toyota is by far the largest seller, with 155,041 vehicles last year, followed by Nissan with 74,323 Frontiers. But Toyota isn't alone anymore. The Chevy Colorado and GMC Canyon are now on sale, and while they haven't yet hit the same volumes, they've won accolades from the only press that matters (ahem, us). Toyota would rather not lose a market they've owned for years and with this latest iteration they address some of the biggest issues with the current track. Namely, a direct/port-injection Atkinson cycle 3.5-liter V6 mated to either a new six-speed automatic transmission or a new six-speed manual. Yes, manual. The 2.7-liter fourbanger returns as a base option. Other new options include a locking bed cover, blind-spot assist, and upgraded infotainment. 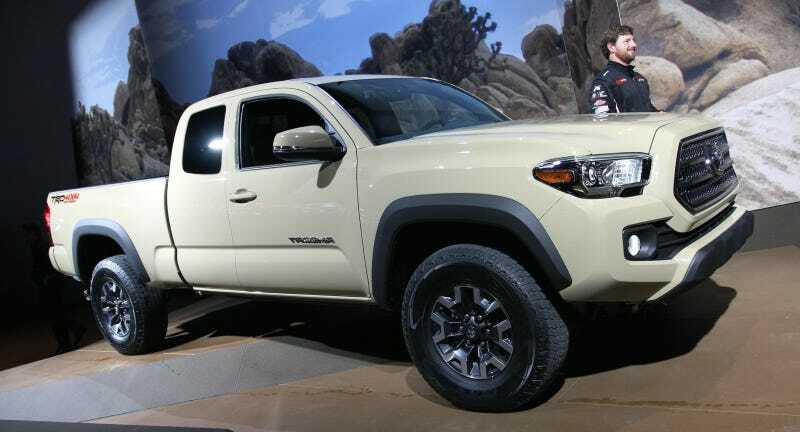 There will be five trim levels, from the base SR all the way up to the TRD Offroad. The top-level 4x4 mode has terrain select option and a built-in GoPro mount.